The split marble column to the left of the main entrance to the Church of the Resurrection. The fissure is 1.20 meters high and resembles a flame rising upwards. 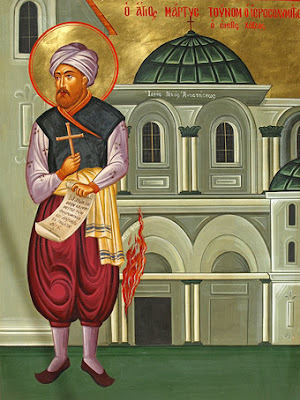 On Holy Saturday 1579, according to the Church chronicles of the city of Jerusalem, the Turkish governors forbade the Greek patriarch and the Orthodox faithful to enter the Church of the Resurrection for the customary rite of the Holy Fire. The works that make reference to this event do not specify the exact date, but they mention that at the time the patriarch of Jerusalem was Sophronius IV, the patriarchs of Constantinople, Alexandria and An ti och were, respectively, Jeremiah, Silvester and Joachim, and the sultan of the Ottoman Empire was Murad III. Outside the Holy Entrance, near the west side, there are three marble columns, and from the middle column, they say, a Holy Fire emanated in the olden days. And it is quite cracked and visible still to this day. And this miracle God showed in the following manner, as they say that back then those who gave orders to the patriarch did not allow [the Christians] to enter and celebrate the feast of the Resurrection, according to custom. The patriarch was outside with the people in the courtyard in the evening of Holy Saturday, and all were sad, holding the candles in their hands. And the patriarch was standing by the throne of Saint Helena, next to a column. And then they say that the Holy Fire came out of that column we said is still quite ruptured, and went to the column near where the patriarch was standing. Then the patriarch lit his candles from there, and then the people lit their candles from those held by the patriarch, as was the custom. Then, it is said that when those in control saw this miracle they opened the sacred door and the patriarch entered with the people and they celebrated the festal liturgy, according to the custom. The same narrative, with more information, is included in many other proskynitaria published in subsequent centuries. The oldest edition of these pilgrimage guides, entitled Proskynitarion of the Holy City of Jerusalem, was published in Vienna in 1749 and was written by Symeon, archimandrite and warden of the Holy Sepulchre. The splitting and igniting of the column which took place at nightfall is confirmed by the work. written by Symeon, published in Vienna, 1749, p. 19. The Vienna edition also mentions another incident related to an Arab emir named Tunom, who at the time of the miracle was in the church courtyard. When he saw the igniting of the column he realized the truth of the miracle of the Holy Fire and confessed to his co-religionists the power of Jesus Christ. After he quarreled with them, his confession became the cause of the order for his execution, and subsequently for his body to be burnt.3 Today he is venerated as an official holy martyr of the Orthodox Church. His memory is celebrated on 18 April and his relics are kept at the monastery of the Virgin Mary, the Megali Panagia, in Jerusalem. Greek Orthodox monastery of Megali Panagia in Jerusalem. "This column is honored by Orthodox as well as non-Orthodox, and even by the Armenians. I would like to write a little about this incident, about how the Orthodox Eastern Christians speak of it unanimously and the Turks themselves confirm it. In the wall there is an inscribed marble slab, and they say that this incident is written on it; but we could not read it because it is written in Syriac letters and in the Arabic language; and I only heard about it, but did not read it." The account of the Moldavian monk is of great importance because it confirms that the splitting and igniting of the column was recorded on a marble inscription written in Syriac letters. What is of significance for our study is that in both cases – whether the pillar was struck by lightning or cracked and ignited on its own – it is a miracle because the patriarch who was standing next to it lit his candle from the fire that was produced. If, however, a fire or electrical discharge struck the column with such great force 430 years ago, then the traces should still be visible. The rupture indeed appears to be burned and eroded by the fire; but to what extent can the traces of this erosion be verified and proven scientifically? 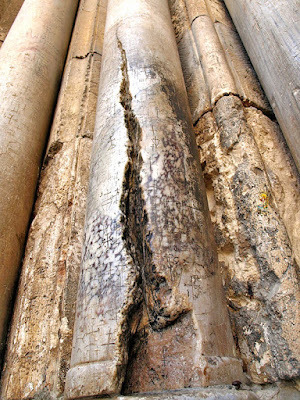 On Easter 2008, the cracked column was the subject of Andrey Volkov’s study. The Russian physicist sent high definition photographs of the crack to a scientific expert, Evgeny Michailovich Morozov,6 who is considered one of the top researchers in the world in the field of Fracture Mechanics7 and Physics of Strength of Materials. Professor Evgeny Michailovich Morozov and his latest scientific work entitled Mechanics of Elastic-plastic Fracture,8 which presents the findings of contemporary laboratory research concerning the theory of fractures and examines issues of the behaviour of objects that have suffered fractures – from the criteria of their development to more complex problems of Fracture Mechanics. This coincidence, that on exactly the Easter when the Fire did not descend, the fracture appeared – is that not a miracle? Of course one could say that all of this was a setup and that the fracture in the column had been created using artificial means. We turned for information to Evgeny Michailovich Morozov, who is a leading expert in the field of Fracture Mechanics not only in Russia, but in the entire world, and has written more than 800 scientific papers on this subject. Evgeny Michailovich examined the high definition photographs of the fracture and declared explicitly that this could only appear as a result of electrical discharge; such is its structure. What does this mean? That it was completely impossible for anyone to manufacture this fracture: imagine how powerful a transformer one would need, and particularly in the sixteenth century, when people had no idea about the existence of electrical energy! Undoubtedly, the scientific opinion of Evgeny Morozov carries great weight and confirms the written sources that mention the miraculous splitting of the column. But I wanted a second opinion on the matter and so I turned to one of the leading Greek scientists in the field of Fracture Mechanics, Professor George Α. Papadopoulos10 of the University of Athens, to whom I sent high definition photographs of the fracture. Thank you for your email dated 31/1/2010. I believe I can be of assistance to your worthy project. For the last thirty-five years I have been working with Experimental Fracture Mechanics at the Physics of Strength of Materials Laboratory of the National University of Athens and I believe wherever there is no scientific explanation, there is a miracle. I have no reason to doubt the Munich Library manuscript dated to 1634 which gives an account of the miraculous manner of the rupture of the column as well as what ensued: that the Greek patriarch used this Fire to light his candle. I do not believe it is possible to doubt a miracle and especially where there are related accounts. By examining the fracture from the photographs, we could conclude that it is a result of combined pressure: a combination of electrical discharge (probably a strong lightning bolt) and a large seismic tremor. The electrical discharge, due to the high momentary temperature, embrittled the material in the column down the length of a narrow area (origin). The surface seismic wave put pressure on the column resulting in torsional oscillation (fatigue). This simultaneous pressure resulted in the fracture beginning at the base of the column and continuing upwards in a zigzag course (as it appears in the photograph the course of the fracture is not linear) along the length of the area made embrittled by the electrical discharge. If the above indeed occurred, in my opinion this simultaneous combined pressure of the column remains inexplicable. Therefore, one could speak only of a miracle. Dear Mr. Skarlakidis I would like to offer my congratulations on your work and I wholeheartedly wish you great success. 1. Προσκυνητάριον της Ιερουσαλήμ και των Λοιπών Αγίων Τόπων, 1608–1634 [Proskynitarion of Jerusalem and the Οther Ηoly places, 1608–1634], ed. Α. Papadopoulos-Kerameus, with Russian trans. by G.S. Destounis, St. Petersburg 1890, p. 17. 2. Symeon, Προσκυνητάριον Αγίας Πόλεως Ιερουσαλήμ [Proskynitarion of the Holy City of Jerusalem], Vienna 1749, p. 19. 4. Monk Parthenius (1807–1878) was born in Jassy in Moldavia (today Romania). 5. Monk Parthenius, “Holy Week and Pascha in Jerusalem,” Orthodox Life 34 (1984), pp. 28–29. 6. Professor Evgeny Morozov, born in 1927, is a graduate of the Moscow Aircraft Institute. He holds a doctorate in engineering sciences and is Professor of Physics of Strength at the Moscow Institute of Physical Engineering. 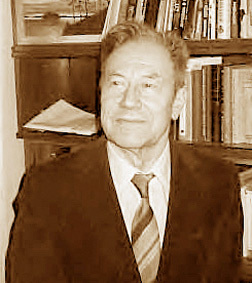 He has developed mathematical equations computer programs (CAE) and specialized theories related to the characteristics of materials tolerance to the formation of fractures and the limits of materials tolerance. His academic and research career began in 1951 and he has received many distinctions and awards. 7. Fracture Mechanics is the science concerned with the study of fractures and the formation of ruptures in materials. It uses methods of analytical mechanics in order to calculate the force exercised during the formation of a fracture, as well as with experimental methods that calculate the tolerance of a material to fracture and its rupture. 8. 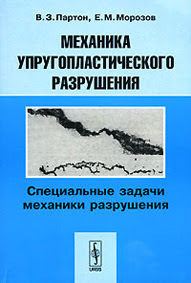 The book was written by Morozov and Vladimir Parton and is entitled, Mechanics of Elasticplastic Fracture, Special problems of Fracture Mechanics, Moscow 2007. 9. Vera, 21 April 2009. 10. 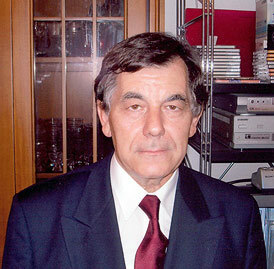 George Α. Papadopoulos is Professor of Materials Mechanics at the National Technical University of Athens and has written many papers and scientific articles on the field of Fracture Mechanics. See G.A. Papadopoulos, Fracture Mechanics: The Experimental Method of Caustics and the Det.- criterion of Fracture, London 1993.